When the National Association of State Boating Law Administrators (NASBLA) held their annual Instructor Development Conference in Lexington, KY, in December, no one was caught off-guard by the vast amount of wisdom in the room. The NASBLA courses have always featured top-tier instructors, and in the era since the Memorandum of Understanding between the Coast Guard and NASBLA was signed in 2012, establishing the NASBLA Boat Operations and Training (BOAT) Program as the National Standard for the purpose of training and credentialing State, Local, County and Tribal maritime law enforcement officers and rescue personnel, the quality of instruction has gotten only better. What did surprise more than a few at this latest conference, however, was how many of the instructors present are former Coast Guard personnel, brimming with personal underway knowledge that they’re now giving back to the latest generation of partners on the water. “The knowledge and experience that our prior Coast Guard instructors bring to the program is irreplaceable. During a NASBLA course delivery, the average experience of the instructor cadre ranges around 90+ years of professional deck plate maritime experience. 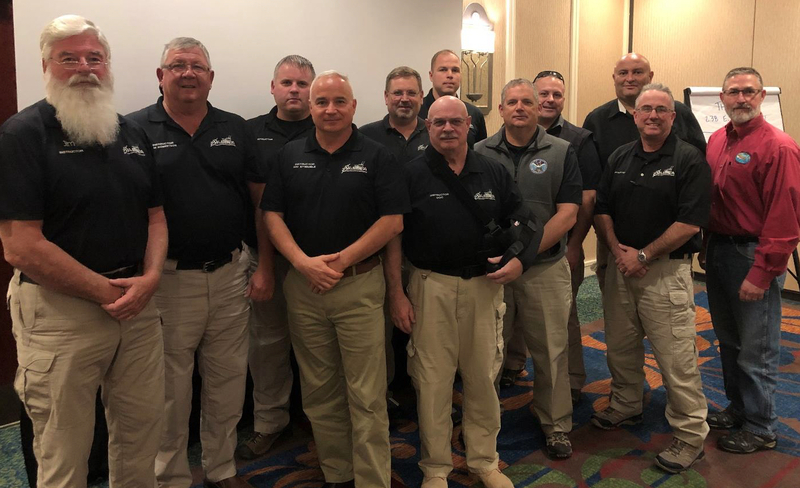 We are all proud to share what we learned in the CG with the nation’s law enforcement and first responders who are operating at the tip of the spear!” said Dave Considine, NASBLA’s BOAT Program Director. Every individual pictured above once wore the uniform of the United States Coast Guard. They are, pictured left to right, Jim Mullinax (CWO BOSN, Ret. ), Jim Robertson (CWO BOSN, Ret. ), Guy Wendorf (Former PS3, now SGT, Indiana DNR), Maurice “Mo” Etiemble (CWO BOSN, Ret. ), Dave Considine (BMCS, Ret. ), Brian “Doc” Wells (BMCM, Ret.) in front, Joe Tenbarge (BM1, USCGR and Indiana DNR Conservation Officer) behind Doc, Charlie Mallow (Former BM3, now Florida FWC), Daryen Granata (former BM1, Scarborough ME Fire), Pete Louzao (CWO BOSN, Ret. ), Mike Powers (BM1, USCGR Ret., now Massachusetts Environmental Police Detective Sgt), Jeff Wheeler (CWO BOSN Ret., now Deputy Chief, USCG Office of Boat Forces and USCG liaison to NASBLA’s BOAT Program).